If you’re looking for a hot hatch, that’s not quite a hatch, but still delivers on fun, power, practicality and driver engagement, take a look at the Hyundai i30 Fastback N.
The Hyundai i30 Fastback N is a swoopier version of the i30 N hatch, with a slightly bigger boot and a bit less headroom for those in the back. It’s got the same engine (which has had a few minor tweaks), and the same power as the hatch, and fortunately, it’s just as good to drive. On top of that, it’s competitively priced, and comes with plenty of kit as standard. Definitely worth a look if you’re looking for a hot hatch, that’s a bit more grown up. Interested in buying a Hyundai i30? The Fastback shape blurs the lines between a hatchback, a saloon and a coupe. It’s basically a slightly longer, swoopier version of the i30 N hatch. Compared to the standard Fastback – which already had a few sporty touches such as the wrap-around rear lights and a spoiler lip on the boot lid – this new, more powerful N Performance model gets a new N grille, different front and rear bumpers, and a subtle lick of red paint at the bottom of the bumpers. Buyers will also get 19-inch alloys with Pirelli P-Zero tyres, and red brake calipers. There’s a choice of six colours, including Shadow Grey, unique to the Fastback N, and the Performance Blue first seen on the i30 N hatch. The i30 Fastback N has taken a leaf out of the VW or Ford hot hatch design guide, going for subtler/sleeker styling, than the all-out, in-your-face aggression of the likes of the Honda Civic Type R.
As is the case in most hot hatches, there isn’t much to mark out the N model, from the regular Fastback. Overall, the interior quality is ok, although it’s not up there with a VW Golf GTI. There are a few hard, scratchy bits of plastic. You do get front sports seats, some red stitching and various other accents around the interior that are unique to the N model, as are the driver mode buttons on the steering wheel. The button on the left allows you to select from three drive modes - Normal, Eco and Sport - and the chequered flag button on the right unleashes N mode. If you press that twice, you can access a custom N mode that allows you to personalise various aspects of the car, and store them for future use. There’s also an 8.0-inch touchscreen infotainment screen which is easy to use and has bright graphics, although it’s not the best system out there. It comes with a few physical buttons around it, which are handy to access menus when you’re on the move. Just like the standard i30 Fastback, the Fastback N gets a decent amount of room inside, and it pretty much matches the majority of rivals in its class. Taller drivers and passengers shouldn’t have any trouble with headroom in the front. There’s plenty of adjustment in the front seats, which adjust electronically, although some people might wish the driver’s seat went a bit lower for the full sporty experience. The steering wheel adjusts for both height and reach. There’s quite a small rear window, so visibility out the back isn’t great, although the Fastback N does come with a reversing camera to help you out when parking. The sloping roofline does give a bit less headroom in the back compared with the i30 N hatch, but it still won’t be a problem for most passengers. The transmission tunnel running down the centre of the car is low and quite flat, so foot space for those travelling in the middle rear seat is better than in some rivals. The Fastback N has a bigger boot than the hatch: 436 litres of space with the seats up, and 1,337 with the 60/40 folding rear seats down, which is more room than a Golf GTI. It would be a bit bigger still, but in order to maximise the car's stiffness, you get a metal bar that runs across the boot floor, taking up a bit of space, and it also means you won’t get a totally flat load floor. If you need to carry more stuff and get somewhere sharpish, you might want to take a look at a Seat Leon Cupra ST or Skoda Octavia vRS. The Fastback N really does grip well and has good body control. You’ll feel perfectly confident chucking it around corners. The steering is weighty, precise and pretty quick, which is exactly what you want from a car like this, especially if you find yourself on a winding, hilly road. 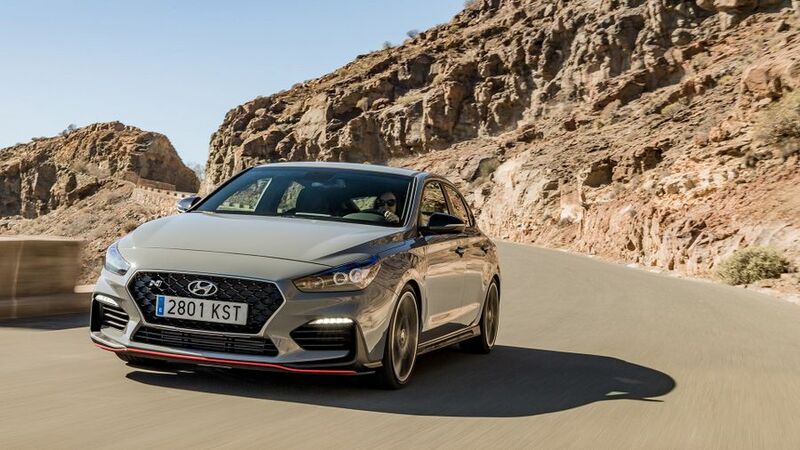 The Performance model – which is the only one coming to the UK – comes with an electronically controlled limited slip differential to help with handling and cornering, an exhaust that will definitely put a smile on your face with its fun pops and bangs, and bigger brakes, than the standard i30 Fastback. Changing the driver mode changes all sorts of settings, including the high-performance parameters of the engine, electronic stability control, limited slip differential, exhaust sound, steering, throttle response and suspension. With so many settings to play with, you can customise your own perfect set-up. Hyundai has tweaked the suspension to make it ever so slightly less firm compared with the i30 N hatch. It's still on the firm side in Normal mode, but it’s not uncomfortable, and you could happily have it as a daily driver. However, don't go anywhere near N mode unless you're indulging your track-day habit, because it's way too much for the public road. Overall, the Fastback N isn’t quite the most precise and all-round capable hot hatch out there – look towards the Honda Civic Type R for that – but it’s not far off, and it’s hard not to smile every time you get behind the wheel. The Fastback N Performance uses the same 2.0-litre, four-cylinder turbocharged engine with 275 horsepower, that is found in the i30 N hatch. The engine pulls hard from just below 2000rpm, and keeps going strong through the middle of the rev range. It’s also flexible, and you won’t struggle to overtake cars on the motorway in fifth gear. The engine is paired with a six-speed manual gearbox that is a joy to use. The travel between gears is quite short, so changes feel sporty, and lock into place nicely. The Fastback N also comes with a launch control programme, for maximum traction and speed off the mark, and it’s got a rev matching function that blips the accelerator automatically, to help you get slicker gear changes. If you really put your foot down, you can feel the steering wheel tugging from side to side as you accelerate, but that's not unusual in a powerful front-wheel drive car, and it’s not so aggressive that you’ll be struggling to rein it back in. The i30 Fastback N Performance is a shade more expensive than the i30 N hatch, and sits between the Volkswagen Golf GTI Performance and the Golf R price wise. While you do get more power and standard equipment than you get on the GTI Performance, the Fastback N likely won’t have as strong resale values as the Golf. On the WLTP cycle, the official fuel consumption figure is 34mpg, with 178g/km CO2 emissions. Those figures aren’t particularly high. Also bear in mind that if you spend more time in Sport or N mode, you will be seeing considerably less than that. The standard Hyundai i30 has a very good rating on Warranty Direct’s Reliability Index, which takes into account the number of times a car fails, the cost of repairs, the amount of time off the road due to repairs, and average age and mileage. There’s no reason the more powerful Fastback N shouldn’t be as consistent. Hyundai as a brand sits comfortably in the top half of the manufacturer rankings on the Reliability Index, and the company in general has a great reputation for reliability. With the Fastback N, you get a five-year fully-transferable, unlimited-mileage warranty, that includes roadside assistance and vehicle health checks. The standard i30 was awarded the full five-stars in the Euro NCAP crash test in 2017, and that score extends to the Fastback model, which comes with all the same kit. That means you get six airbags, hill-start assist, and if you do an emergency stop, the brake lights will flash to warn drivers behind you. On top of that, you get a Forward Collision Avoidance Assist system that warns drivers of a potential upcoming bump, and can apply the brakes for you too. There's also a driver attention alert that will warn you to take a break if it senses you’re tired, a lane keep assist that steers you back into your lane if you’re drifting out of it, and high beam assist that automatically dips your lights to stop you dazzling oncoming traffic. The Fastback N is the most expensive version of the i30 Fastback out there, so you would expect it to have lots of kit, and it does. As standard, you get keyless entry and engine stop/start, heated front seats and heated steering wheel, front- and rear parking sensors, a reversing camera, automatic wipers, climate control and cruise control. To keep you entertained, the Fastback N comes with six speakers and a USB port, and on the 8.0-inch touchscreen you get sat-nav, live traffic alerts, local information, DAB, Bluetooth and Apple CarPlay and Android Auto connectivity. The Hyundai i30 Fastback N might have a slightly clumsy name, but there’s nothing remotely clumsy about how it drives. The various modes really do change the character of this car. While you’ll still have some fun in Normal, it’s nothing compared to the smiles you’ll get from N mode. This is a car that can be a relatively civilised daily driver, or a bit of a monster, depending on your mood. There are hot hatches out there with more power, but you’ll have to pay for it, and as an overall hot hatch package, the Hyundai i30 Fastback N is most definitely worth a look.